This is me looking pretty damn happy with myself 🙂 Two reasons – Yes, I’m late to the Anna dress party – but i’m here now and I don’t care! And if you don’t know what I’m talking about, it’s the Anna dress from By Hand London – which has taken the sewing blogosphere by storm this summer. I think it may be the start of a beautiful relationship…. Secondly – I am in love with these little lace up wedge boots from Marks and Spencer. Yep, that’s right – M&S! This dress is sort of my tester Anna dress. I’ve been wanting to make the maxi dress version and wanted to see if I could get away without making any alterations. 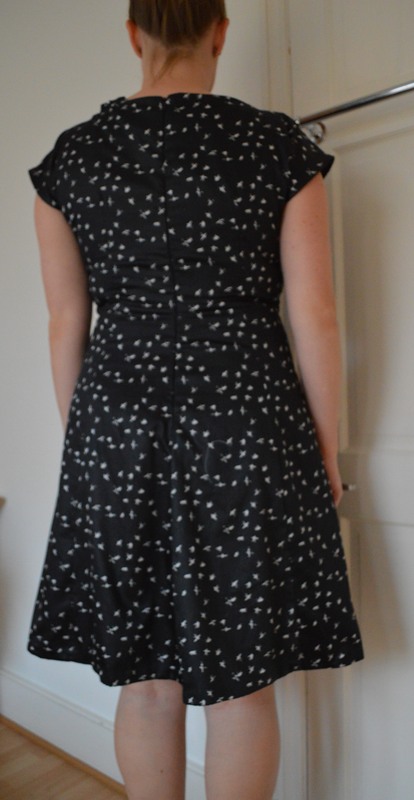 I made this dress up in a size 14/18 in a lovely black cotton sateen that I am struggling to remember where I bought it from. 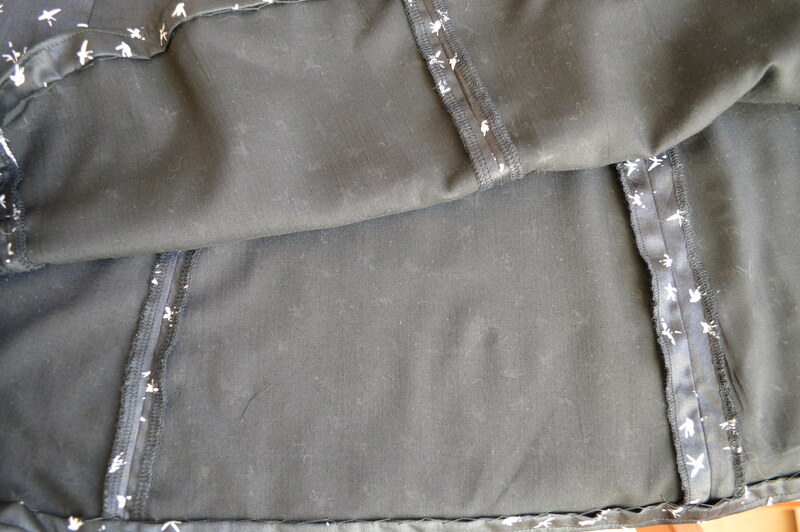 Possibly Ditto Fabrics, possibly Fabrics Galore – But who really cares, this fabric is awesome! 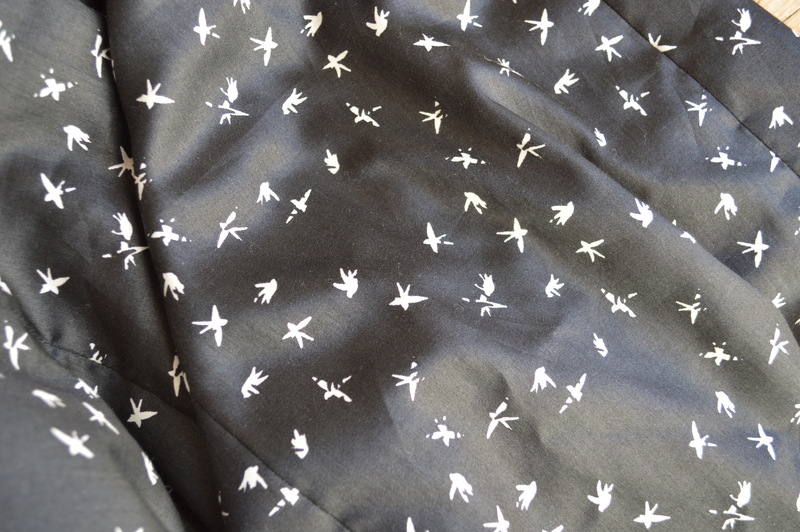 Here’s a close up of the fabric – I’ve always thought it looks a bit like birds or possibly hands… I can never decide but I guess hands would be a bit creepy, so we’ll go for birds I think…. And because the midi dress doesn’t feature a thigh high split, you can get away with overlocking/serging your seams for an extra fast finish – Hooray! I’ve flatlined it with black poly-cotton. Sadly, I couldn’t find any pure cotton for my lining. I don’t normally use poly-cottons at all as I much prefer natural fabrics against my skin but there was no plain black cotton lining type fabric in my local fabric shop at the time. And from the back – pretty awesome too. Although I have sadly just realised that the facing is sticking up at the back! Just got my copy of this pattern. I really like every version of this dress. Yours looks great!